A scholar of the history and culture of early modern Japan, Conrad Totman began his career as a student of ornamental horticulture at the University of Massachusetts. After graduation in 1953, Totman served in the army for three years in South Korea where got his first taste of Japanese culture during leave. His experiences in Japan piqued his scholarly interest, and upon his return to the states with his new wife Michiko, he finished college at UMass and did his graduate work at Harvard where he received a doctorate in 1964 for a study of politics during the Tokugawa period. 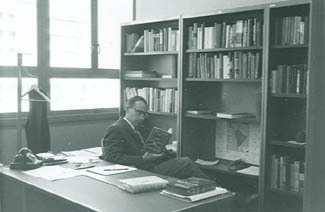 Totman held academic positions at UC Santa Barbara, Northwestern, and Yale before retiring in 1997. The bulk of the collection documents Professor Totman’s education and professional work as a scholar and teacher of Japanese history. Dispersed throughout is a treasure trove of information on Japan in general, and particularly on his specialties: early modern Japan and forestry and environmental management. An enormous, highly influential, and cherished part of Totman’s life is his family, and the Totman clan is well represented in this collection. Reams of genealogical material document the rich heritage of the Totman family, including the transcribed love letters and diaries of his paternal grandmother and biographies of Totman ancestors, as well as hundreds of letters written between Michiko and her family in Japan.